Did you know that #biweek and Celebrate Bisexuality Day, the international day of #bipride, is also part of intersex history too? Ladyboy GG, also known as GG Raven Wilbur, is an intersex and bi elder who worked alongside BiNet USA's Wendy Curry and Michael Page to create both Celebrate Bisexuality Day and the Bisexual Pride Flag. 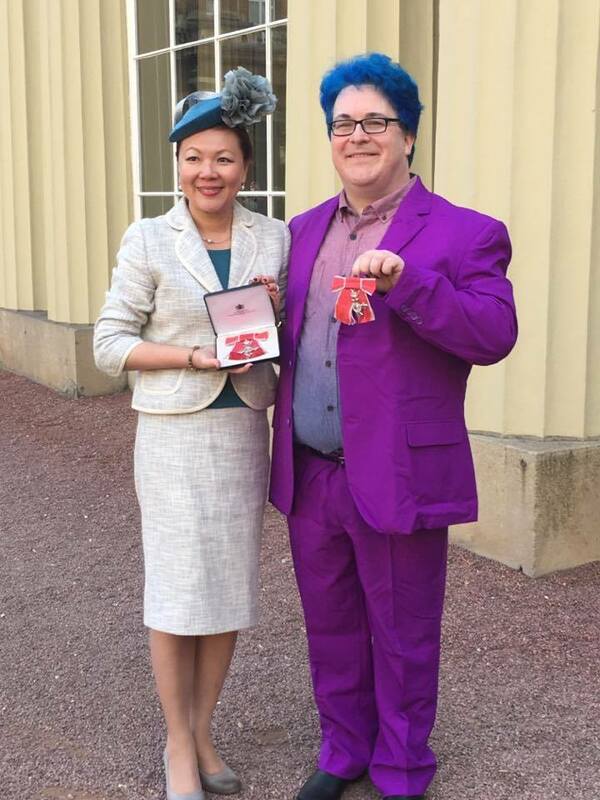 On behalf of GG and so many bi+ intersex people, BiNet USA sends warm congratulations to intersex advocates on the 20th anniversary of Intersex Awareness Day. Learn more about the intersex community and "intersextionality" in this week's BiCast podcast with Sean Saifa Wall and BiNet USA President Faith Cheltenham as part of BiNet USA's Black History Month All Year Long series! Did you know that #biweek is also a part of asexual history too? Although the first ever #biweek occurred at University of California, Davis all the way back in 2008, national bi organizers didn't consider launching a bisexual awareness week to fall alongside Celebrate Bisexuality Day until after the emergence of Asexual Awareness Week, founded by bi+ ace rockstar Sara Beth Brooks. Learn more about the asexual community in this week's #aceweek BiCast podcast with Sara Beth Brooks and trans ace cartoonist Dylan Edwards! Did you know that many bi, pan, fluid, queer (bi+) people, like BiNet USA President Faith Cheltenham, identify as bi+ intersex? Or leaders like The BiCast's own Lynnette McFadzen identify as bi+asexual? 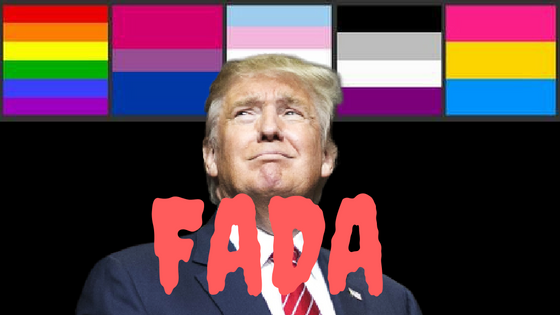 As time goes bi, more members of bi, trans, intersex and ace ("BITA") communities find we have much in common whether it be the erasure of our contributions from "gay history", lack of awareness of the violence that has been visited upon us by the state, or the very real lack of specific resources designed to save, and keep safe, bi+, trans, ace, and intersex lives. As well, our communities share many leaders, mentors, and supportive allies who believe that none of us are free, unless we all are. 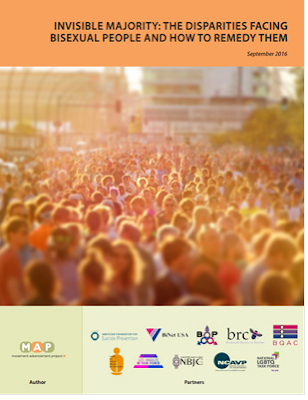 BiNet USA applauds the many LGBTQIA institutions like the National LGBTQ Task Force who have acknowledged ace and intersex communities, including the historic efforts of the United Nations just this week. Check out the video below and learn more about the campaign here. Learn more about intersex and asexual communities at the links below. FROM BI NATIVE WRITER, JEN DEERINWATER, AN URGENT REQUEST. I a citizen of the Cherokee Nation of Oklahoma and a Native, Bisexual, Disabled journalist. It is crucial that Native People are able to tell our stories to the world in our own voices, especially for Native Women and LGBTQ Two Spirit Natives. I'm reaching out to you for emergency financial support to travel to Standing Rock in Cannonball, ND to report the news from the front lines against the Dakota Access Pipeline. The Dakota Access Pipeline has been covered well in Native media, but most of the mainstream media coverage that has occurred, has been primarily by non-Native journalists who often have been unwilling to avoid utilizing racist tropes, misinformation and anti-Native sentiment in their reporting. As a Native Woman, it is my duty to stand with my relations to protect the water, but also to report to the human rights violations that are occurring there. Our realities must be told to the world and they must be told by us. Because I'm a freelance writer I do not have the financial support that some journalists have. I'm asking the greater community to help me make this mission a reality by making donations and sharing my request with your friends and community. 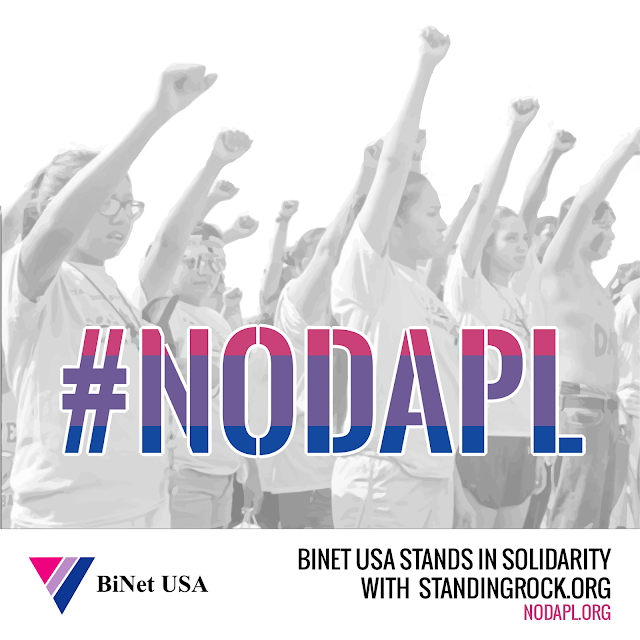 BiNet USA has sent bisexual and pansexual pride flags to Jen Deerinwater to take with her to Standing Rock. Please consider donating or sharing this request widely. Bi+ fluid singer, Frank Ocean, who also identifies as a proud member of the LGBTQ community, attended the last state dinner with President Barack Obama and First Lady Michelle Obama on October 18th, 2016, alongside his mother Katonya Breaux. BiNet USA congratulates Mr. Ocean and his mother on their attendance at the last White House state dinner. We are thrilled that a bi, pan, fluid, queer (bi+) identified writer and visionary such as Mr. Ocean was honored in this way. We send our greatest thanks to President Obama and Mrs. Obama for including the "B in LGBT" in their policies, events and administration over these last 8 years. 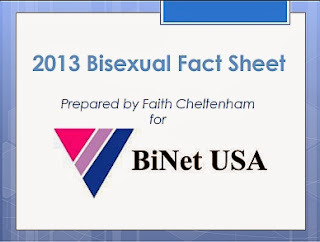 On September 26, 2016 over 100 Bi+ (big bi+ umbrella - bi/pan/fluid/queer/heteroflexible/homoflexible/asexual) activists visited the White House for the 1st official on-the-record White House Bisexual Community Briefing. 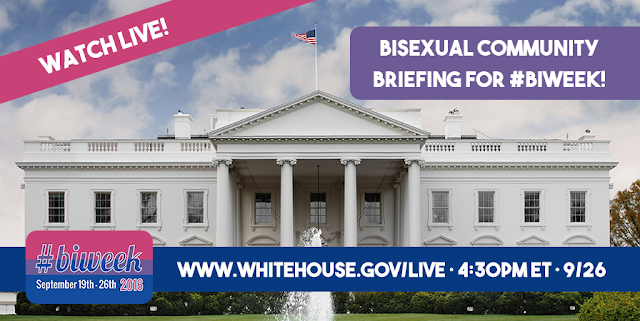 Dr. Lauren Beach of Vanderbilt University, Luigi Ferrer of Pridelines and Elizabeth Fernandez of SEIU Florida were in attendance at the White House Briefing and will join Pridelines on October 21st, 2016 in Miami for an exciting series of events, "Bisexuals Take Over The White House". Bi+ Community Potluck - 7pm - please bring a vegetarian or vegan dish and a beverage to share, BYOB - we will have youth in the building and some of us are in recovery so low visibility and moderation are appreciated. Come at 6:30 to help us set up if you can. 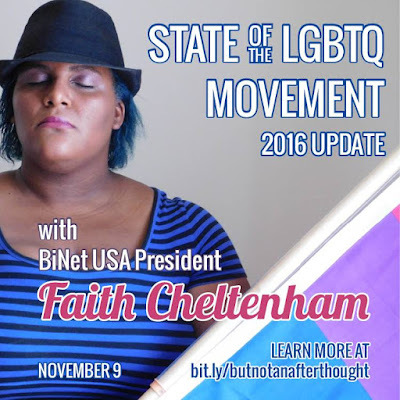 Review of DC Bi+ Awareness week events - 8pm - A short panel discussion of the 9/23/16 Celebrate Bisexuality Day Capitol Hill Bi+ Community Briefing, the 9/25/16 Bi+ Unconference at HRC Headquarters, and the 9/26/16 White House Bi+ Community Briefing. This invitation is extended to all our allies in the broader LGBTQ community come join us to Celebrate Bisexuality! Bi+/LGBT Community Dance - 8:45pm - DJ JessieMix will be spinning for us, come join in the celebration. 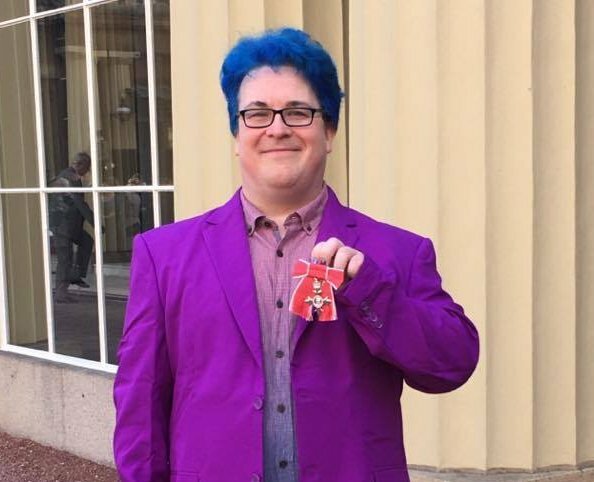 BiNet Joins GLAAD's Anti-Bullying Campaign "Spirit Day"
Though there have been many policy advancements for the LGBTQ community, there is still more work to be done. According to recent studies, 8 out of 10 LGBTQ students experience harassment at school, and over 60% of LGBT students who did report a bullying case said their school staff did nothing. We also know that bisexual youth report higher levels of harassment and bullying, and lower levels of social support than their gay and lesbian peers. These problems among bi+ youth too often translate into disparities among bisexual adults related to physical health, mental health, and economic status. By participating in GLAAD's Spirit Day, we hope to show bi+ and other LGBTQ youth that there are people they can go to for help, acceptance, and support. Will you join us in taking a stand against anti-LGBT bullying? All participants will be featured on GLAAD's official website, so be sure to sign up! Past Spirit Day participants include Britney Spears, Laverne Cox, Demi Lovato, Ariana Grande, Kim Kardashian, the White House, MTV, HBO, hosts of Good Morning America and CNBC, non-profit organizations like the Ali Forney Center, DoSomething.org, and the National Center for Transgender Equality, and hundreds more nonprofits, celebs, national landmarks, companies, and teams.